The main message is--Oxalic acid removes rust. Wood bleach from the paint department is usually Oxalic acid crystals. Check the ingredients to be sure. Dissolve it in warm water until saturated (until some remains undissolved). Brush on. Rinse thoroughly. It's mildly toxic. Use rubber gloves and rinse off body quickly. For rust on driveways go here. First, don't use chlorine bleach--this sets the iron stain. Rust stains can usually be removed using the oxalic acid solution. The grocery store cleaning powder "Zud" contains Oxalic acid and is reported to do a good job on rust stains. I've used it to remove some well aged rust stains on our sidewalk. I wet the area, sprinkled on Zud powder, scrubbed with a brush -- took a little elbow grease but it got rid of the rust. Or, try a trichloro-melanine compound such as "Barkeepers Friend." Zud contains an abrasive (like Comet clenser) with can scratch the surface of porcelain sinks and tubs. Sprinkle it on and moisten it. Let it sit and see if it removes the stain. If you must rub it around, do it gently to minimize abrading the surface. Once the surface is scratched or worn down stains will return quickly after removal. For rust stains already set on hard surfaces, dissolve oxalic acid crystals in a small amount of hot water; then, add enough whiting or talc to make a soft paste. Apply this poultice to the stain and let dry. Rinse and polish. Use with care; remember, it's poisonous. As a last resort you may want to try a 'pumice stick'. A white block of pumice (volcanic rock) about the size and shape of a stick of butter. 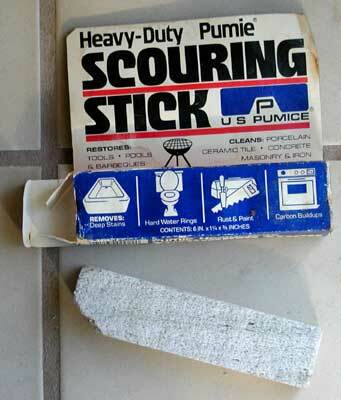 Pumice is a mild abrasive--mild compared to sandpaper. If you're desperate you may want to try sanding it off with 400 grit wet-or-dry sandpaper -- this will abrade the surface of the object. Get a product called "Whink." Read the warnings on the bottle. Here's the method I use for carpets, it should work in principle for any cloth stain. Test it on an inconspicuous area first to see if it discolors the material. I wet the stain by spraying water from a Windex/409 type spray bottle. (I use a better quality one of these bottles from the home center.) I then put a little of the Whink in a glass dish (like a custard dish), dip a Q-Tip in it and swab each stain with the Q-Tip until it disappears. Then, I turn the spray bottle on stream and wet the treated area fairly liberally to rinse out the chemical. Last I use a towel to blot up as much water as I can. A good final test is to put down a dry towel over the area and put your weight on your bare heal, pressing the towel into the wetted area. If it comes up dry you've done all you can to lift out the water. This method will probably also work with the Oxalic acid solution instead of Whink.